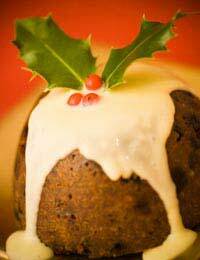 This recipe makes a delicious, moist, Christmas pudding! It can be difficult to find a recipe for this special occasion pudding that tastes and look as good as the conventional one but is wheat and gluten-free. Look no further...this is the one. The quantities given make one good sized pudding which easily serves 8 people. Plastic pudding basins with lids are ideal for this recipe. This is the part that kids’ love to get involved in (see the Christmas traditions note below). Chop all the berries and dried fruit so that there is nothing larger than a 5p coin in size. Mix all the dry ingredients together, sifted flour first. Add the margarine, breadcrumbs and sugar next, followed by the beaten eggs. Next in is the brandy and milk. At this stage your pudding should have a soft, gooey, dropping consistency. Lightly grease one 1.1 Litre pudding basin (or two smaller ones if preferred.) Spoon in the pudding mixture, but don’t fill your basin right to the top because the pudding will expand during cooking-and you’ll need to top it up with brandy! A gap of 1.2 to 1.5 cm is about right. Cover with a lid and place the pudding, lid end up, in a large pan of boiling water. The water should cover the bottom two thirds of the pudding basin-top up with more boiling water as needed during cooking. Boil the pudding steadily for 6 hours. It’s worth it! Remove pudding from the pan take off basin lid and leave to cool. Cover with a circle of greaseproof paper beneath the lid and store in a cool place. Check regularly and top up with brandy - about one tablespoonful a week should keep it moist. On Christmas Day, boil the pudding for a further 2 hours and serve as desired. To make it a real family occasion - and to pass on an old Christmas tradition - make your Christmas pudding on an otherwise dark and miserable day, when everyone’s home together for a while. In my native Sussex, the Christmas pudding-stirring was quite a ritual, with Mum or Grandma usually the first person to stir the pudding mixture and make a wish as they did so. It was always done with a wooden spoon; symbolic of the wooden manger - and stirred from left to right; representative of the direction travelled by the Three Kings as they followed the star. After the family matriarchs had taken it in turns to stir the pudding and make a wish, the spoon was passed to all the children, starting with the youngest and ending with the eldest. The eldest child then passed the spoon to Dad then Grandad and that wonderful feeling of continuity, a family united, was complete! Then the men would disappear, our normal squabbling would resume and Mum would be left with all the washing up...Back to reality; but there was a brief moment of something magical to remember.